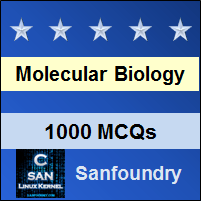 This set of Molecular Biology Multiple Choice Questions & Answers (MCQs) focuses on “Engineered Genes and Their Use”. 1. Which of the following is the genetically engineered insulin? Explanation: The first genetically engineered insulin is humulin. It was manufactured by the company Lily in USA. 2. Genetically manufactured GH is not effective for? Explanation: New pharmaceutical products such as genetically manufactured GH are created by cloning certain genes. The genetically manufactured GH is extremely effective for the treatment of skin burns, bone fractures and ulcers in digestive tract and other ailments but not against infections. Vaccines are effective against infections. 3. Active insulin consists of how many polypeptide chains? Explanation: Active insulin consists of two polypeptide chains, the A chain and the B chain. The A chain consists of 21 amino acids and the B chain consists of 30 amino acids. The chains are joined together by two disulphide linkages. Explanation: K. Itakura and collaborators in 1977 chemically synthesized DNA sequence for the two chains A and B. these were incorporated in two separate pBR322 vectors and were synthesized then combined in vitro to produce active insulin. Explanation: The Insulin A vector does not contain B-chain it contains the A chain. A separate pBR322 vector is needed for the production of the B-chain known as insulin B vector. 6. Pick the odd one out. Explanation: Somatostatin, somatotropin and β-endorphin all are genetically engineered growth hormones. Insulin is a genetically engineered hormone but it is not a growth hormone. 7. Genetically engineered somatotropin is formed by introducing DNA fragment from the genome to the plasmid. Explanation: Genetically engineered somatotropin is formed by introducing cDNA of the gene to the plasmid. The cDNA is produced by the reverse transcription of the mRNA produced from the gene encoding somatotropin. 8. Which one of the following was first expressed as a fusion protein? Explanation: Somatostatin is a 14 residue polypeptide hormone synthesized in the hypothalamus. It was the first polypeptide which was expressed in E. coli as a part of a fusion protein which inhibited the secretion of growth hormone, glucagon and insulin. 9. How many classes of interferons are found in humans? Explanation: The humans have 3 classes of interferons. They are alpha (leukocyte) interferon, beta (fibroblast) interferon and gamma (immune) interferon. 10. Synthesis of hGH is an inducer dependent process. Explanation: Synthesis of hGH is induced by an inducer of lac operon, that is isopropylthiogalactoside. The hGH thus produces is subsequently purified for commercial use. Explanation: The major enzyme required for the production of a chimera molecule is restriction endonuclease. It is the enzyme responsible for the isolation of desired fragment from the genome and the specified end producing cleavages that are essential for the ligation of the DNA insert in correct position. Explanation: The subunit vaccine for hepatitis B is created against the viral surface protein. It shows an antigenic property in the body but is not harmful and cannot infect the cells of the body as it does not contain any genetic material thus fulfilling the sole purpose of producing subunit vaccine. 13. Pick the odd one out. Explanation: Antibodies are proteins that are produced by the hybridoma technology. The others, vitamins, antibiotics and alcohols are organic chemicals that are produced by using recombinant DNA technology for commercial purposes. Explanation: Hybridoma technology is a process for the production of monoclonal or identical antibodies. The production of monoclonal antibodies by the hybridoma technology was invented by Cesar Milstein and Georges J. F. Kohler in 1975.